Your friends anniversary is coming up. How do you wish them a happy anniversary? Here are 75 wedding anniversary wishes for friends and family that are certain to put a smile on their faces. Feel free to copy and paste them straight into a text message! Why reinvent the wheel when people have already spent countless hours thinking of what to say? And what better way to tell people happy anniversary than with a famous quote about marriage? Here are some anniversary quotes we compiled to help you share some wisdom on their big day! A marriage is a special bond between two people. Your friend’s marriage is a blessing, so let them know with these heartfelt marriage anniversary wishes! There’s nothing wrong with keeping it simple. Sometimes it doesn’t take much to tell the people you love how you feel. Here are some simple anniversary wishes your friends will love to read! A couple who laughs together stays together. We’ve put together some classic anniversary jokes and puns that your friends (and spouses) are sure to remember! Who doesn’t love inspirational Quotes? They lift the spirit and remind the recipient of just how great their journey is, as well as how much better the future is to come. Use these inspirational wedding anniversary quotes to make an already great day even better! Check out our selection of wedding sparklers for your big send off! 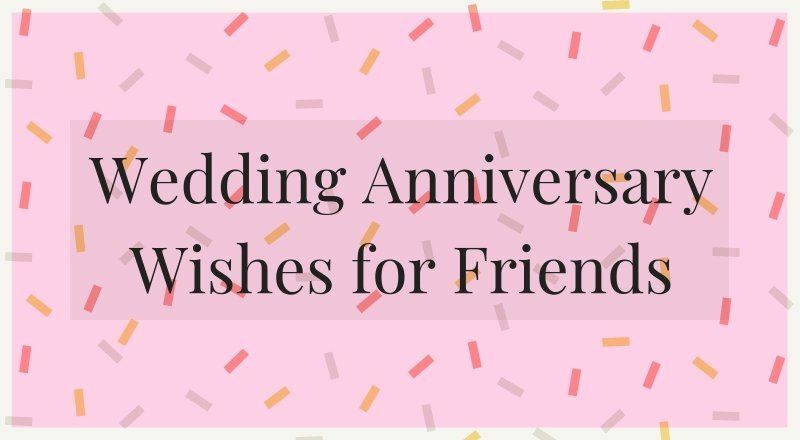 Sure, this post is about anniversary wishes for friends. But we believe that your spouse is your best friend. After all, you spend almost every moment together! Share these awesome anniversary wishes with your significant other on your big day. Got a Good Anniversary Quote You’d Like to Share? Did we miss an awesome anniversary wish? Leave it in the comments below so we can add it to our ever-growing list (and give you credit of course! ).